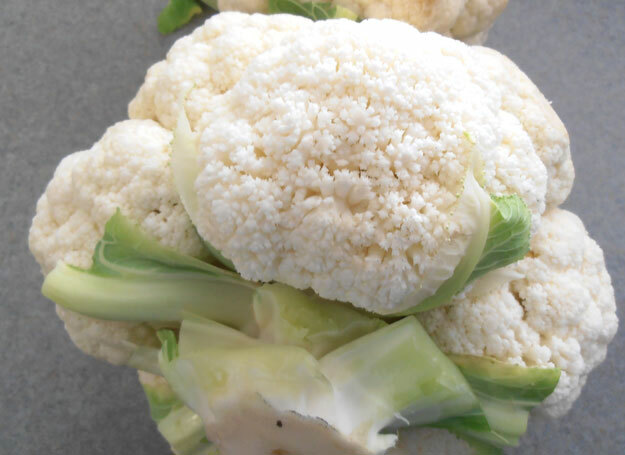 Have you ever seen cauliflower that appears to have a grainy, or ricey appearance? Every now and then I am sure will come across this defect. This defect is called “Ricey.” Riciness occurs while growing, due to high temperatures during curd development, and is more prevalent on curds being overmature and from rapid growth, maybe due to excess nitrogen. The ricey appearance comes from the development of small, white flower buds. Even though the defect originates in the field and the grower can easily see this defect at the time of shipment, the USDA has classified this defect as a condition defect, insinuating that this defect may not have been visible at time of harvest and developed in transit, or while in storage. I disagree with their theory, as I have never seen or heard of anyone receiving perfectly good cauliflower, but while in storage for a few days their cauliflower developed riciness. Some people feel that ricey cauliflower affects the flavor, while others feel it only detracts from the appearance. Rest assured, that it is safe to consume cauliflower showing riciness, but it may affect your preferred taste. The USDA does have a specific scoring guideline if you do encounter ricey cauliflower. Score as damage when the ricey condition has an abnormally rough and granular appearance affecting an area greater than 25% of the surface area of the curd. This defect is scored against the total defect tolerance of 10%. In the image above, the ricey area this is visible would be considered abnormally rough and granular in appearance, but without seeing the entire head it is impossible to say whether more than 25% of the surface area is affected. Is there a size tollerance on Medium Zucchini or Mexican Gray squash that can be rejected it it is bigger than usual? Jeff, thanks for question concerning sizing on squash for both Zucchini and Mexican Gray Squash, They are both considered as being Summer Squash, and yes there are size tolerances. For squash not meeting a stated minimum size reaquirement, there is a tolerance of 5%. And your question about squash being bigger than usual, there is a 10% tolerance for squash not meeting a stated maximum size. Now if you are asking what the maximum size specs are for “medium” squash, there are no reqirements that I am aware of. There are no size requirements for medium or any size squash in the U.S. Grade Standard. If a buyer and seller agree to a minimum and/or maximum size spec, the two would then follow the tolerances allowed for each, 5% for undersize and 10% for oversize. But this would only come into play if the agreement was reached before the product was shipped. Hope this helps.